Take-off was smooth and we soon settled into our seats with an extra luxurious 5 centimetres of legroom. It made quite a difference since my knees no longer touched the seat in front as in the previous flight. Again we were boxed into two seats next to a window by a third seat. The usual drinks were served, then a movie (Nurse Betty) started showing on the screens. Michelle searched for a soundtrack but could only find one in Italian. A couple of minutes into the film, it stopped, then restarted from the beginning. Thinking it must have been to get the English soundtrack up and running, we searched for it again on the in-flight channels but without luck. Again the movie stopped just a few minutes in. Then they started showing 102 Dalmatians instead. Cruella DeVille sure has one wacky hairstyle. Dinner (our second of the night) was a choice of stir-fried chicken or fish in a tomatoey sauce. We had one of each so Michelle could get the cheese and biscuits, but there wasn't any, so she made do with the nice hot bread rolls. I wasn't really hungry but tried the fish, which was quite good. I also demolished the tops of the two desserts, which were chocolate mousses on a base of cream with some sort of dried fruits mixed in it. We tried to sleep a bit, getting accustomed to the Roman time zone, but it's difficult getting a proper sleep on a plane. Thankfully the kid in the seat in front of Michelle didn't throw up like the one in the other plane. Our route took us over India, Turkmenistan, Azerbaijan, Turkey, and Greece. We looked for lights a few times but didn't see any, although we saw stars. After several hours of fitful snoozing through the night we eventually made it to the last two hours of the flight. As the sun rose slowly outside the plane we passed over Turkey and Greece. We saw a huge city which we thought might have been Istanbul during the night, but judging from the map they showed on the video screens sometimes it looked as though it was probably Baku. The ill-fated Nurse Betty screened again, again only in Italian, but this time it made it all the way through. We were served a breakfast choice of scrambled eggs or asparagus crepes. The eggs were edible but the crepes had too much asparagus. The hot croissants were nice though - Michelle went back for seconds after eating half of my first one too. Then it was time to land! We flew into Fiumicino Airport about a minute after 06:00, with the land just beginning to brighten with the dawn. The land around the airport seemed to be mostly empty fields, not the urban sprawl of many other cities. When we had taxied to the terminal, the door right near us opened and we were among the first people off, except for the upstairs first class passengers who all got to get off while we were held back by a flight attendant. Immigration was a simple glance at our passports - not even an incoming passenger card to fill out, then we were through to baggage claim. Again the first class people got to go first, but our baggage was among the first economy ones to come out, probably since it had been loaded after everyone else's after we'd arrived in Bangkok from Sydney. Our dream run continued when the customs inspector waved us through without a second glance at our luggage, and before we knew it we were standing outside. We walked through to the railway station, stopping to unpack our backpack straps so we could carry our bags more easily. Being so early, the ticket office wasn't open yet, but a newsagent there sold tickets and we bought two to Roma Termini station. Unfortunately, the first direct train didn't leave until 07:37, leaving us almost an hour to wait. There was nothing for it but to sit around in the dismal station. A few suburban commuter trains came in and departed while we were there. Eventually our train arrived and we boarded after Michelle took a photo of me validating my ticket. The train trip to Rome's Termini station was interesting at first as we passed through fields and typically Italian looking hills with little farms or villas on them. But as we approached central Rome we saw endless ranks of apartment buildings, mostly very old and dingy looking. Nearly all had metal shutters on all the windows, including ones 5 or 6 storeys off the ground. 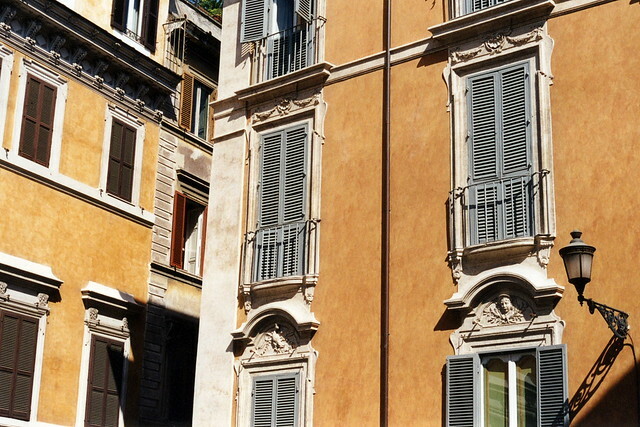 I think everyone in Rome must live in buildings like this, and there must be millions of them. At about 08:10 we stopped at Termini. We wandered up the platform looking for an exit that would leave us near out hotel for the next few days. Michelle decided she needed some chocolate and took a look at a small food stand on the platform. Amongst the usual Mars bars and so on was something called Espresso Pocket Coffee. Michelle liked the look of them and bought a pack. They turned out to be chocolates filled with a soft liquid centre which resembled thick espresso coffee - very strong. She said they were a good buy as she bounced down the platform. We found a sign pointing to an exit on Via Marsala and followed that, which led us to an apparent dead end, although we could see the street just outside a room there which was full of packages. Trying to go through the room to the street succeeded in getting a man to help us find the correct way, around the room via a passage we had missed. A quick walk along Via Marsala led us to Via Marghara and the Hotel Rimini. We were far too early to check in, so we left our backpacks in a room there and left to have a look around the streets of Rome. Interestingly, the lift in the hotel was about the size of a phone booth, with a sign inside saying it could take a maximum of three people, although Michelle and I had trouble squeezing in with our bags. First we walked back to Stazione Termini and tried to find an intercity train timetable to allow us to plan out the rest of our trip. After some fruitless searching we asked at the information booth and the man there told us there was no printed timetable - they only had it on their computers. So we left to check out some of the sights. 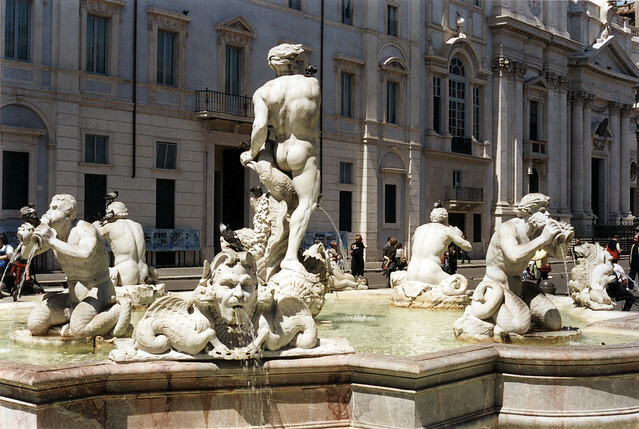 A short walk from the station we came to the Piazza della Repubblica which had an interesting fountain, and our first real encounter with trying to cross a busy street full of Roman traffic. Definitely a learning experience. We noticed that the red lights on each set of traffic lights were twice the size of the orange and green lights - and still people ignored them and continued driving so long as there was space to squeeze a car through. There were no lane lines marked on the streets, so the cars just drove along 4 or 5 abreast depending on how many could fit. The streets were also full to overflowing with motor scooters - the classic Italian Vespa and a zillion other makes, driven by all sorts of people from businessmen in Armani suits to teenage girls in fishnet stockings. 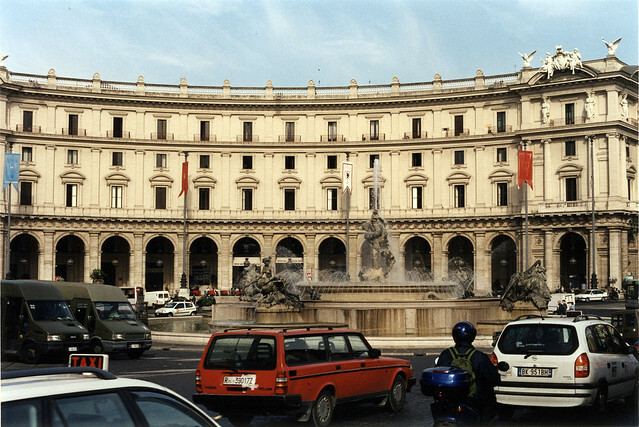 From Piazza della Repubblica we walked down Via Nazionale to the Largo Magnanopoli. A street stall along the way supplied us with an apple each - but we had to go and choose the most expensive apples the guy had! When we'd finished the apples we stopped for a cappuccino for Michelle and a gelato for me. I got to try my Italian and managed to order successfully, although the guy who served me the gelato kept talking to me and I had no idea what he was saying. At one point we passed a fairly nondescript looking building among all the monumental architecture around us, which we would have totally ignored, except that an old woman apparently saw that we were tourists and beckoned us to come inside and have a look. We did so, and were glad we did. This turned out to be the Chiesa di Santa Maria in Via, and it was well worth ducking in to see the magnificent interior. 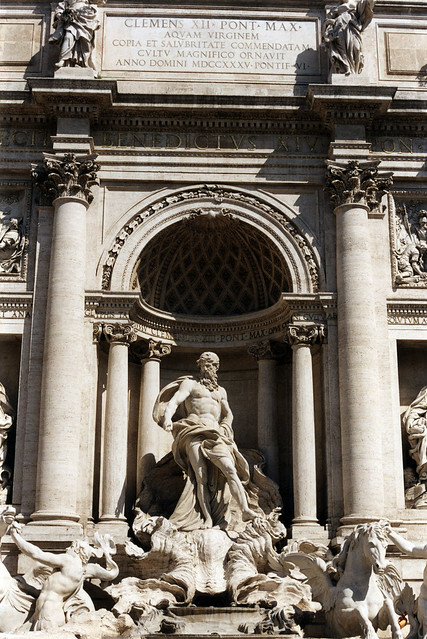 Walking north we came to the Fontana Trevi - sure to be a highlight of any trip to Rome. Only for us it was not working and there were workers crawling all over it with rubber boots, rubber gloves, and buckets full of something smelling strongly of chlorine, scrubbing and cleaning it all. It didn't stop there being a huge crowd of tourists there, nor indeed most of them from tossing coins in to the dry marble basins where they clanged and rolled around. I think one of the poor workers even got hit with a coin! 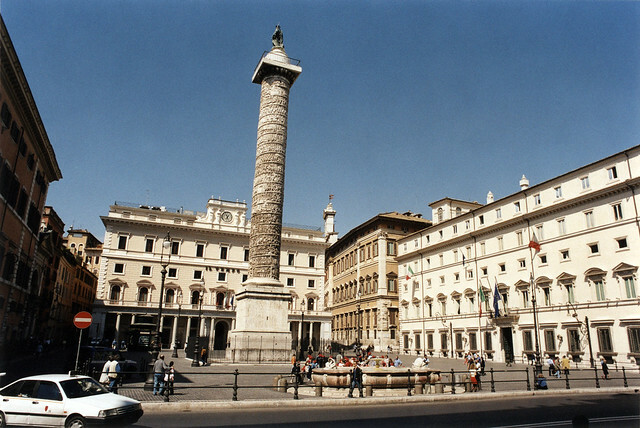 From there it was a short walk through narrow twisty streets full of people and the occasional scooter and car to the Piazza Colonna with the marvellous Roman Colonna di Marco Aurelio, the Column of Marcus Aurelius. A little more walking took us to the Piazza della Rotonda. I was just trying to work out what the magnificent old Roman building in the middle was when a chap asked if we spoke English, and if so would we be interested in a free guided tour of the Pantheon? Apparently history students run these for visitors. We took up the offer, as did a couple from Boston and a couple from Mallorca. 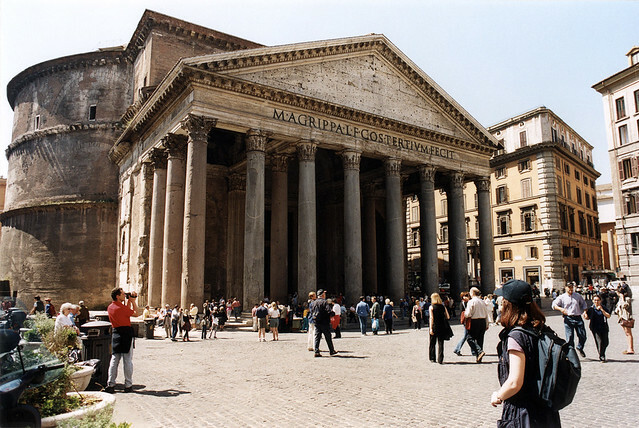 As the guide led us through the Pantheon, he kept getting eavesdroppers on his commentary to join the group. He told us some interesting stories about the history of the Pantheon and why it is in the particular state it's in today. Then he led us outside and on to the Chiesa di Santa Maria sopra Minerva nearby, facing Piazza della Minerva, a square with a small obelisk mounted on an elephant sculpture, by Bernini. 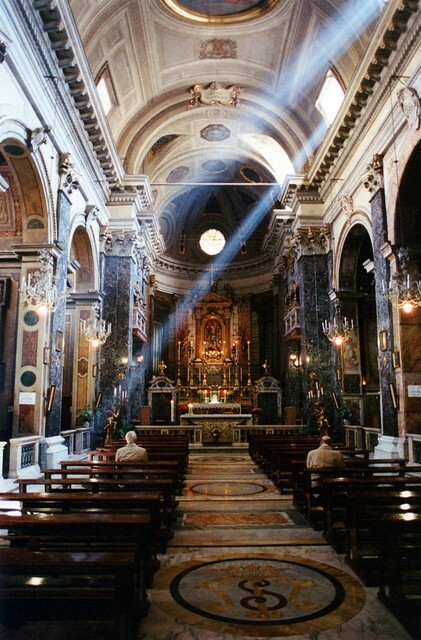 In this church he showed us some recently identified works of Bernini and Michelangelo, with what is probably the only Michelangelo work in Italy which is not wired for burglar/vandal detection - Risen Christ, a marble sculpture of Christ rising from the dead. I switched to my high-speed film in the church for interior shots. We were getting nervous that at the end of this tour he'd start hitting us up for money or something, or lead us into some sort of scam, so we discreetly ducked out of the accumulating group. 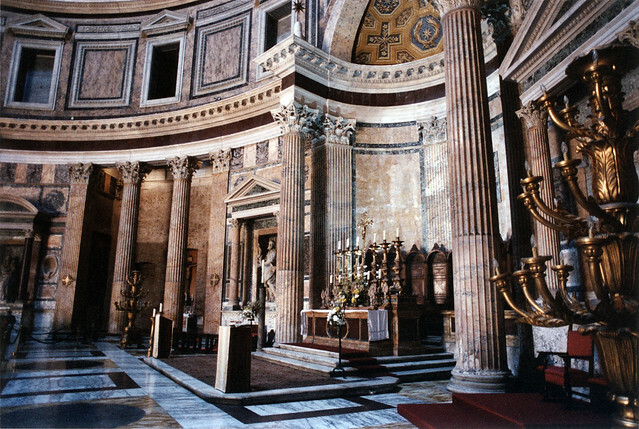 We went back to the Pantheon for some ambient interior light photos. Finally leaving the Pantheon, we headed to Piazza Navona to check out the really touristy stuff there. It was getting quite hot in the sun and we were getting hungry so we walked along to Corso Vittorio Emanuelle II where we found a place that sold pizza by the slice. In fumbling Italian I ordered some for me and Michelle, and the lady switched to English when she couldn't get through in Italian. Michelle had a margherita and I had one with just mozzarella and prosciutto, not even any tomato. We ate it in the shop, sitting at the bench against the wall and it was very good. We also bought a bottle of water before we left. Not sure what to see next, Michelle suggested we try some shops, so I set us off in the direction of the fashion shopping area. We hadn't reached it when we decided that we were too tired and footsore to continue today and started back to our hotel. 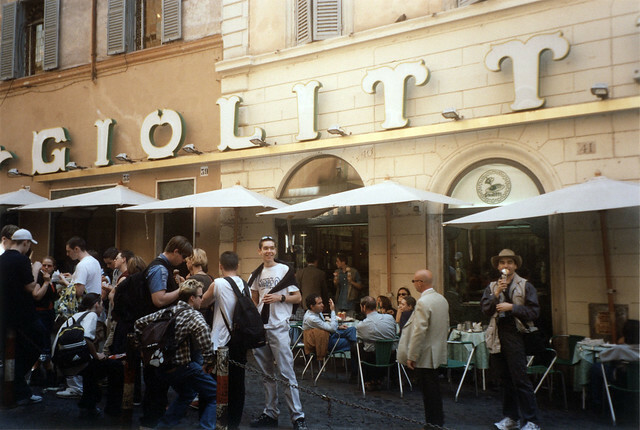 We tried a different route off Piazza Navona and found ourselves walking past the famous Gelateria Giolitti. I simply had to have some, so went for the grande size with maro, limone, e arancia flavours. I'm still not sure what maro is, but I think it was blueberry. At least it was a rich dark purple colour. From there it was a hot slog up a hill that I don't recall us ever walking down until we finally got back to the hotel, after a brief rest stop in the Basilica Santa Maria degli Angeli. This was a run-down old brick building that looked like it was falling to pieces from the outside, but inside it was a most spectacular church with wonderful paintings adorning the walls and ceilings. It was also nice and cool compared to outside! We checked in and had showers in our room to wash away the grime of too many hours on planes and a fairly full day, then simply flopped and rested for a while. Eventually we had to get up again and go out for some dinner. We wandered the nearby streets looking for something not too imposing and where we could order without sounding like idiots. We finally settled on a place with pizzas and pastas on a counter which we could point to if all else failed. The cheerful proprietor spoke about three words of English but we managed to get our food, pizza slices again, this time mushroom for me, margherita again for Michelle. On the way back to the hotel we bought a 1.5 litre bottle of water for tomorrow, for the same price as the 500 ml we bought at lunch. Then it was into bed with the sun still shining outside (though close to setting) for a nice long, well-deserved sleep. Breakfast tomorrow is from 07:00 to 09:30. We're hoping to be in early. Last updated: Tuesday, 26 September, 2017; 20:40:43 PDT.